HP Color Laserjet Enterprise M553. HP has introduced a new breed of LaserJet printers that are smaller in footprint and more efficient when it comes to toner usage and energy consumption. The cornerstone technology of these laser printers is HP’s JetIntelligence cartridges, and it’s a technology comprised of a few characteristics, the main one being new a type of toner called ColorSphere 3. ColorSphere 3 toner cartridges are made up of individual particles that are softer than usual, which means they need less energy to be melted and fused onto a sheet of paper. It’s a key to the new printers not only being more efficient in their energy usage, but also quicker to wake up and start printing than previous printers in the same class. In order to make the toner softer and capable of melting at a lower temperature, a solution had to be implemented to also protect the toner particles from being damaged during their charging process when a print is initiated. HP’s chemists devised a hard shell to sit around the soft core of each particle, preventing it from getting smashed to bits when the charging process for the toner begins. The effect of this is a toner cartridge that produces less wastage due to damaged, unusable toner. Another aspect of the JetIntelligence technology is called Page Maximiser, which is simply a redesign of the toner cartridge itself to remove unnecessary bits and pieces from the physical make-up of the cartridge. The end result of this minimalist design is a toner cartridge that has a capacity to hold more toner within its confines. 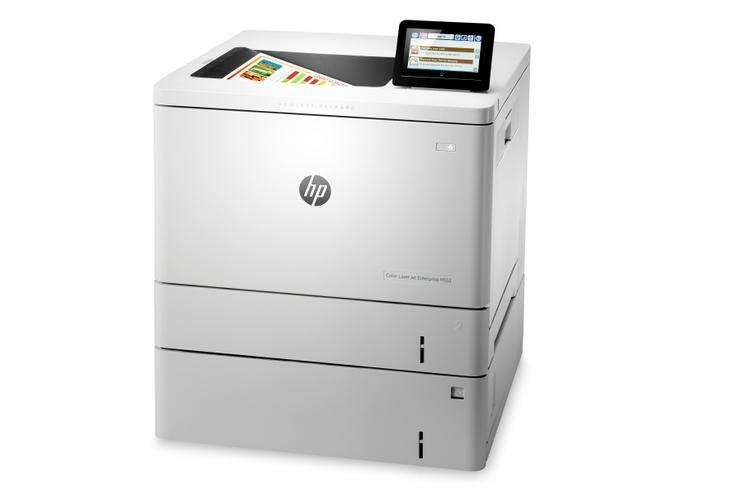 This has allowed HP to get more prints out of its toners without increasing the size of the cartridges, but by making more efficient use of their space. The new toners also don’t have a pull-tab, meaning they are quicker and cleaner to install, and with less waste to throw away during the installation procedure. Working hand in hand with Page Maximiser is HP’s Print Gauge reporting tool. Not only can it detect the amount of toner left in each cartridge, it can also analyse the types of documents have been printed in order to provide a bespoke report on the use of each cartridge and predict when a replacement might be in order. HP’s claim of more efficient printers is based on the printers using genuine toner cartridges. To this end, it has installed anti-fraud technology that can be used to detect if a non-genuine JetIntelligence-based cartridge has been installed. It’s a technology that can also be used to report if a toner cartridge has been unexpectedly removed and swapped, which can guard against theft. HP told us that this feature can be enabled or disabled by the administrator. The end result of all this new toner and cartridge technology is a set of printers and multifunction devices that HP claims are smaller, easier to set up and maintain, up to 53 per cent more energy efficient compared to previous models in the same class, and which can wake up and print up to 40 per cent faster than competitors. • HP Color LaserJet Pro M252: a printer only that’s suitable for the home or office workgroups of 1-5 users. It’s good for 250-2500 pages per month. It costs $249. • HP LaserJet Pro M277n: a multifunction printer for the home or for office workgroups of 1-5 users. It’s good for 250-2500 pages per month and costs $349. • HP Laserjet Enterprise M522dn ($899) and Laserjet Enterprise M533 ($999): these are laser printers designed for workgroups of 5-15 users and have a recommended page output of 2000-6000 pages per month. The models differ in speed, with the M533 being able to print more pages within the same time frame.